These cookies are a ginger lover’s dream. They are both crisp and chewy at the same time and totally addictive. In a food processor pulverize the brown sugar and the ginger until the ginger is finely diced and set aside. In a sauce pan melt the butter, take off the heat and let cool slightly. Combine all the ingredients except the eggs and mix well. Add the eggs and stir until well combined. Drop 1 ½ tablespoon of batter at a time on the parchment flattening the mounds into a circle with the back of a spoon, spacing about 3 inches apart. Bake until golden brown about 13-15 minutes, cool on a wire rack. 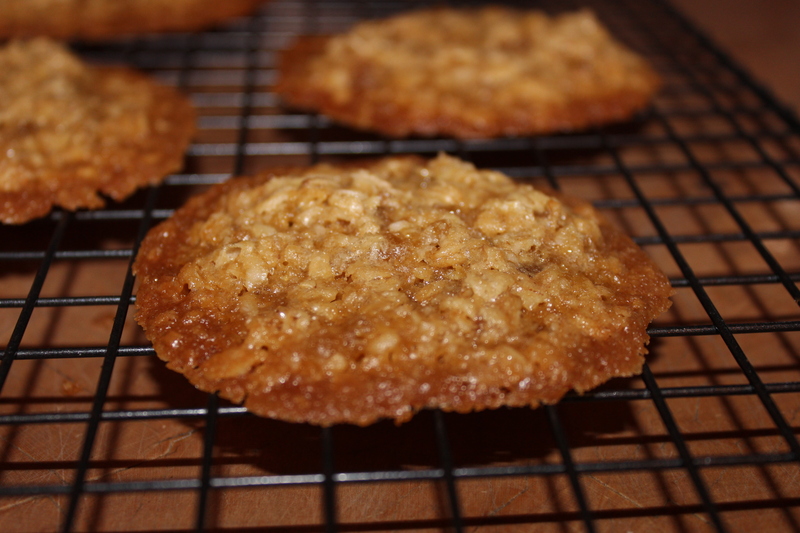 This entry was posted in Recipes and tagged cookies, dessert, Ginger, Gluten-Free, Oatmeal. Bookmark the permalink. Mmmm these will definitely help quell my ginger craving!